PUEBLO, Colo. – J.B. Mauney loves to compare bull riding to a light switch. When he is on, J.B. Mauney is ON. When he is off, the two-time World Champion is OFF. Mauney did more than just turn his bull riding light switch back on this past weekend in Billings, Montana. He ripped the entire light switch out of the wall when he rode 2016 World Champion Bull SweetPro’s Bruiser for 94.25 points for his first win of 2017. Mauney’s electric event-winning ride sent shockwaves through not only Rimrock Auto Arena, but also the PBR world standings. The 30-year-old’s 4-for-4 performance earned him a massive 778.3 points toward the world standings – the most amount of world points earned by a rider this season at a non-PBR Major – and the sport’s winningest active rider is up to No. 3 in the world standings. “I have said it numerous times. Bull riding is like a light switch,” Mauney said. “I felt like before here, it flickered a little bit and it was on and then it was back off. Hopefully it is switched on this time. Mauney had won zero events and only one round this season before breaking off back-to-back round wins on Championship Sunday with his 89.5-point ride on Mudshark in Round 3 and his dominance aboard Bruiser in the championship round. Mauney is a perfect 3-for-3 against the reigning World Champion Bull. “I would rather be 94 than 88 any day,” Mauney reiterated after the event, adding he wasn’t concerned over the fact that Bruiser had broken his jaw and collarbone before. Mauney would also rather be No. 1 instead of No. 3 in the world standings. “I am not where I want to be,” Mauney said earlier in the weekend. “Every time you nod your head you have to take advantage of it because these guys ahead of you don’t slip pretty much. Any time you can make the whistle and get some points that is what it is about. Mauney made sure to take advantage of world leader Eduardo Aparecido being unable to compete because of a riding arm injury. The active leader for 90-point rides (72) is now within 1,123.76 points of Aparecido thanks to the 31st event win of his career, which is also the most among active riders. The Mooresville, North Carolina, cowboy is one win away from tying Justin McBride for the most wins all time (32) and is four rides away from joining Guilherme Marchi and Mike Lee as the only two riders in PBR history to ride 500 bulls on the Built Ford Tough Series. Those records mean close-to-nothing to Mauney if he doesn’t have more gold championship hardware being added to his resume this November at the 2017 Built Ford Tough World Finals. Mauney knows overcoming Aparecido and his 1,000-plus point deficit is going to be a challenge, but it certainly isn’t impossible. The 12-year veteran overcame a 1,662.5-point deficit in 2015 to win his second world title after missing five events because of a torn left ACL. Mauney had fallen significantly behind previous world leader Joao Ricardo Vieira before returning to competition on April 25, 2015, to win the Des Moines Invitational in his first event back. He then placed second the next weekend in Colorado Springs, Colorado, to get within 622.5 points of Vieira before the Brazilian concluded the first half by winning Last Cowboy Standing to increase his lead to bump his lead back up to 1,350 points. However, Mauney stormed out of the summer break with back-to-back victories in Biloxi, Mississippi, and Tulsa, Oklahoma, and two weeks later a second-place finish in Thackerville, Oklahoma, gave him the world No. 1 ranking. Mauney never let it go and ran away with the 2015 world title. 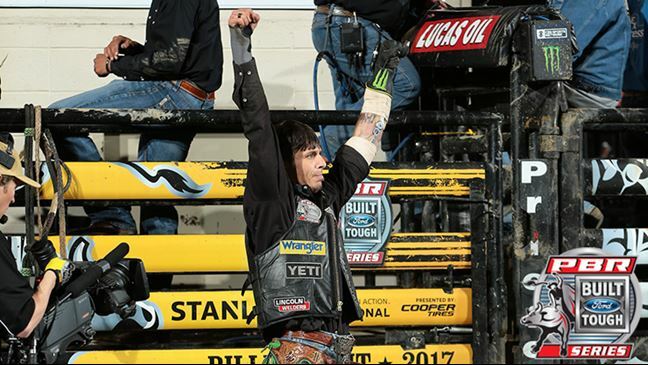 It was an amazing turnaround that featured Mauney going 20-for-28 and posting all eight of his 90-point rides in the final three months of the season. Then there is also the evidence of Mauney’s herculean, come-from-behind performance in the PBR’s old points system in 2013 when he rallied from 10th in the world standings, and a 3,056 points deficit, to defeat Silvano Alves on the final day of the World Finals for his first world title. In fact, Mauney is 185-for-329 (56.23 percent) from Aug. 1 through the Built Ford Tough World Finals in his career. However, he still has two more events, including a PBR Major in Last Cowboy Standing, to easily take another chunk out of Aparecido’s world lead before we even begin the second half. But will the light stay on for the rest of the season now that Mauney has turned it on? He is still only 19-for-41 this year and his 46.34 percent riding percentage is the fourth-lowest of his career. Some have questioned Mauney’s health, but he has still only missed two events so far this season and is actually on pace to ride at his most events (25) since winning his first world title in 2013 in 23 events. Mauney bristles when asked if the Father Time and health questions are getting old. It is an overreaction to his struggles this season, Mauney believes. Call it a lightbulb moment or whatever you like, but Mauney is not ready to give up on his pursuit of a record-tying third World Championship anytime soon.